President Howard W. Hunter had a great love for the scriptures and was a dedicated student of them. This love and study were reflected in his teachings, which were filled with stories and other passages from the standard works. Often when teaching a gospel principle, especially in general conference, he selected at least one story from the scriptures, told it in detail, and drew applications from it. For example, when teaching about being committed to God, he recounted the stories of Joshua; of Shadrach, Meshach, and Abednego; and of others in the Old Testament who showed such commitment (see chapter 19). When teaching about service, he used examples from the Book of Mormon to show how some people who received little acclaim were “no less serviceable” than others whose service was more visible (see chapter 23). When teaching about how to have inner peace in times of turmoil, he again used extended passages from the scriptures, including the story of Peter walking on the water (see chapter 2). When teaching about the sacrament, he provided context by reviewing the story of the children of Israel and the Passover (see chapter 15). 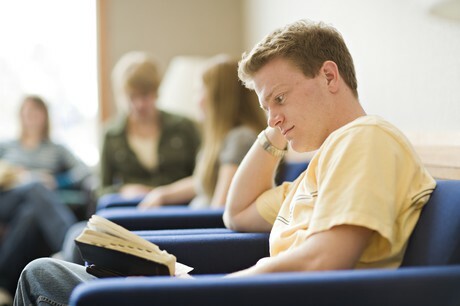 Studying the scriptures is the most profitable of all study in which we can engage. Studying the scriptures helps us learn and obey God’s will. In order to be obedient to the law of the gospel and be obedient to the teachings of Jesus Christ, we must first understand the law and ascertain the will of the Lord. This is accomplished best by searching and studying the scriptures and the words of the prophets. In this way we become familiar with what God has revealed to man. Among [the] Articles of Faith is one that declares, “We believe all that God has revealed, all that He does now reveal, and we believe that He will yet reveal many great and important things pertaining to the Kingdom of God” (Articles of Faith 1:9). God’s will has been revealed in the scriptures, and for this reason we have been commanded to read them to find the truth. The Lord explained to Oliver Cowdery how to ascertain these truths. He said, “Behold, I give unto you a commandment, that you rely upon the things which are written; for in them are all things written concerning the foundation of my church, my gospel, and my rock” (D&C 18:3–4). “And I now give unto you a commandment … to give diligent heed to the words of eternal life. “For you shall live by every word that proceedeth forth from the mouth of God. “And every one that hearkeneth to the voice of the Spirit cometh unto God, even the Father” (D&C 84:43–45, 47). To understand the scriptures requires concentrated, consistent, prayerful study. We urge each of you to carefully consider how much time you are currently giving to prayerful pondering of the scriptures. 1. Read, ponder, and pray over the scriptures daily as individual members of the Church. Reading habits vary widely. There are rapid readers and slow readers, some who read only small snatches at a time and others who persist without stopping until the book is finished. Those who delve into the scriptural library, however, find that to understand requires more than casual reading or perusal—there must be concentrated study. It is certain that one who studies the scriptures every day accomplishes far more than one who devotes considerable time one day and then lets days go by before continuing. Not only should we study each day, but there should be a regular time set aside when we can concentrate without interference. There is nothing more helpful than prayer to open our understanding of the scriptures. Through prayer we can attune our minds to seek the answers to our searchings. The Lord said: “Ask, and it shall be given you; seek, and ye shall find; knock, and it shall be opened unto you” (Luke 11:9). Herein is Christ’s reassurance that if we will ask, seek, and knock, the Holy Spirit will guide our understanding if we are ready and eager to receive. Many find that the best time to study is in the morning after a night’s rest has cleared the mind of the many cares that interrupt thought. Others prefer to study in the quiet hours after the work and worries of the day are over and brushed aside, thus ending the day with a peace and tranquillity that comes by communion with the scriptures. Perhaps what is more important than the hour of the day is that a regular time be set aside for study. It would be ideal if an hour could be spent each day; but if that much cannot be had, a half hour on a regular basis would result in substantial accomplishment. A quarter of an hour is little time, but it is surprising how much enlightenment and knowledge can be acquired in a subject so meaningful. The important thing is to allow nothing else to ever interfere with our study. Some prefer to study alone, but companions can study together profitably. Families are greatly blessed when wise fathers and mothers bring their children about them, read from the pages of the scriptural library together, and then discuss freely the beautiful stories and thoughts according to the understanding of all. Often youth and little ones have amazing insight into and appreciation for the basic literature of religion. Contemplating the brief scriptural account of Jairus brings a great depth of understanding and meaning. The life, acts, and teachings of Jesus can be read rapidly. The stories are simple in most instances and the stories are simply told. The Master used few words in his teachings, but each one is so concise in meaning that together they portray a clear image to the reader. Sometimes, however, many hours might be spent in contemplation of profound thoughts expressed in a few simple words. “And besought him greatly, saying, My little daughter lieth at the point of death: I pray thee, come and lay thy hands on her, that she may be healed; and she shall live. “And Jesus went with him” (Mark 5:22–24). … Jesus and those who were with him had just recrossed the Sea of Galilee, and a multitude of people who had been waiting met him on the shore near Capernaum. “And, behold, there cometh one of the rulers of the synagogue.” The larger synagogues of that day were presided over by a college of elders under the direction of a chief or a ruler. This was a man of rank and prestige whom the Jews looked upon with great respect. Matthew doesn’t give the name of this chief elder, but Mark identifies him by adding to his title the words, “Jairus by name.” Nowhere else in the scriptures does this man or his name appear except on this occasion, yet his memory lives in history because of a brief contact with Jesus. Many, many lives have become memorable that otherwise would have been lost in obscurity had it not been for the touch of the Master’s hand that made a significant change of thought and action and a new and better life. This was an unusual circumstance for a man of rank and prestige, a ruler of the synagogue, to kneel at Jesus’ feet—at the feet of one considered to be an itinerant teacher with the gift of healing. Many others of learning and prestige saw Jesus also but ignored him. Their minds were closed. Today is no different; obstacles stand in the way of many to accept him. “And [Jairus] besought him greatly, saying, My little daughter lieth at the point of death.” This is typical of what happens frequently when a man comes to Christ, not so much for his own need, but because of the desperate need of a loved one. The tremor we hear in Jairus’s voice as he speaks of “My little daughter” stirs our souls with sympathy as we think of this man of high position in the synagogue on his knees before the Savior. Then comes a great acknowledgement of faith: “I pray thee, come and lay thy hands on her, that she may be healed; and she shall live.” These are not only the words of faith of a father torn with grief but are also a reminder to us that whatever Jesus lays his hands upon lives. If Jesus lays his hands upon a marriage, it lives. If he is allowed to lay his hands on the family, it lives. The words, “and Jesus went with him” follow. We would not suppose that this event had been within the plans for the day. The Master had come back across the sea where the multitude was waiting on the shore for him to teach them. … He was interrupted by the plea of a father. He could have ignored the request because many others were waiting. He could have said to Jairus that he would come to see his daughter tomorrow, but “Jesus went with him.” If we follow in the footsteps of the Master, would we ever be too busy to ignore the needs of our fellowmen? The Book of Mormon and Doctrine and Covenants will bring us closer to Christ. The Doctrine and Covenants is a unique book. It is the only book on the face of the entire earth with a preface composed by the Creator himself. Furthermore, this book of scripture contains more direct quotations from the Lord than any other existing book of scripture. What experiences have helped you learn that studying the scriptures “is the most profitable of all study”? (See section 1.) How can we strengthen our commitment to be “women and men who know the scriptures thoroughly”? How does studying the scriptures help us be more obedient? (See section 2.) How have you seen that “the words of Christ will tell you all things what ye should do”? (2 Nephi 32:3). What aspects of President Hunter’s counsel about how to study the scriptures could help you? (See section 3.) How has consistent, prayerful study of the scriptures blessed you? What insights can we gain from President Hunter’s account of the Savior healing the daughter of Jairus? (See section 4.) How can pondering just a few verses like this enrich your scripture study? How have the Book of Mormon and the Doctrine and Covenants helped you draw closer to the Savior? (See section 5.) What are some other ways these sacred volumes have influenced you? Consider sharing your testimony of these scriptures with family members and others. “Reading, studying, and pondering are not the same. We read words and we may get ideas. We study and we may discover patterns and connections in scripture. But when we ponder, we invite revelation by the Spirit. Pondering, to me, is the thinking and the praying I do after reading and studying in the scriptures carefully” (Henry B. Eyring, “Serve with the Spirit,” Ensign or Liahona, Nov. 2010, 60). “Reading the Scriptures,” Ensign, Nov. 1979, 65. The Teachings of Howard W. Hunter, ed. Clyde J. Williams (1997), 50. The Teachings of Howard W. Hunter, 53–54. The Teachings of Howard W. Hunter, 51. “Obedience” (address given at the Hawaii Area Conference, June 18, 1978), 3–5, Church History Library, Salt Lake City; the last paragraph is also in The Teachings of Howard W. Hunter, 52. “Eternal Investments” (address to CES religious educators, Feb. 10, 1989), 3; si.lds.org. “Fear Not, Little Flock” (address given at Brigham Young University, Mar. 14, 1989), 2; speeches.byu.edu. The Teachings of Howard W. Hunter, 51–52. “The Mission of the Church” (address given at the regional representatives’ seminar, Mar. 30, 1990), 2. The Teachings of Howard W. Hunter, 54. “The Pillars of Our Faith,” Ensign, Sept. 1994, 54. “Evidences of the Resurrection,” Ensign, May 1983, 16. The Teachings of Howard W. Hunter, 55–56. Invite class members to share how the teachings in the chapter help them better understand the scripture passages referenced in the chapter.